T he wedding season is upon us, and besides the obvious do’s and don’ts, the question “what to wear” doesn’t seem an easy one to answer! And dressing up for your best friend’s wedding can be tricky too... You would want to look your best, fit in with the theme, yet, not overshadow the bride! Mehendi function is one of the most enjoyable functions, it is less formal than the wedding and cocktail so you can plan to add a fun element to your outfit too. Don't shy away from experimenting. We chose this pistachio green sharara which we believe is a really trendy option these days. Keep the outfit light with less embellishment so that you have freedom of movement because you know you’re going to be dancing all night. 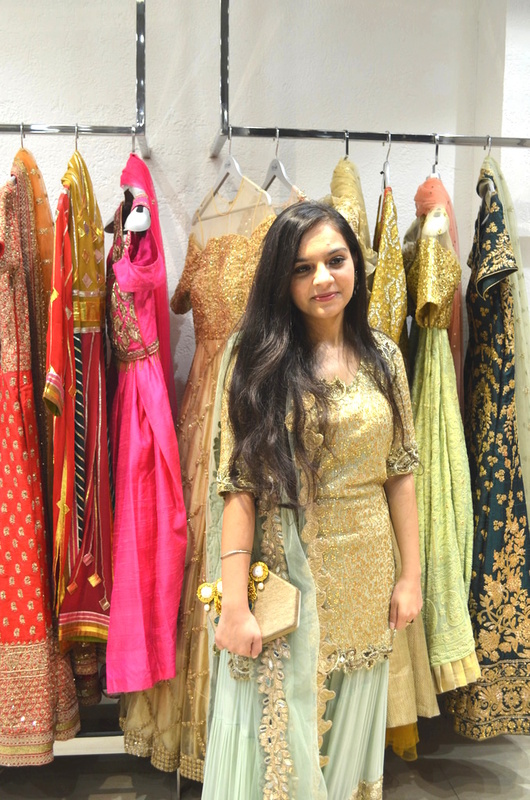 You can actually go for a heavy dupatta and a dressy clutch like the one we chose. We had a really tough time picking an outfit for the wedding – there were just so many stunning options! After much looking around, we finally decided upon this gorgeous peach lehenga with v-neck choli by Shantanu & Nikhil. The lehenga is intricately embroidered along the border. So choose something that looks rich & heavy but of course, stay away from reds & pinks. For accessorizing, we chose this embellished clutch in a matching shade. If your choli has mock collar, you can do away with necklaces or heavy danglers, instead work your outfit with a statement piece like we did with pearl & kundan passa... and you’re all set to go to the wedding! We had our eyes set on this royal blue skirt & crop top set for the cocktail party! 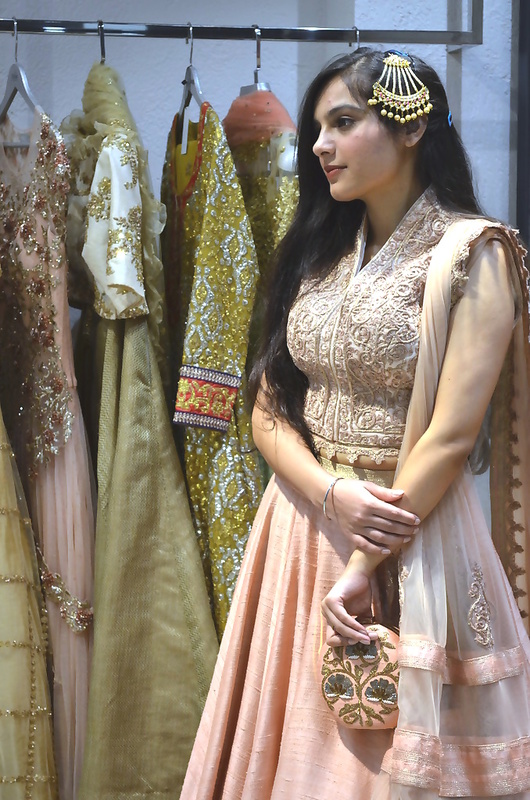 And this is by their in-house designer Aarna – it has some really stylish and contemporary pieces for anyone who’s not too much into the conventional wedding look. Did you notice the cape-like thing on the top? That is just so drool-worthy! For a conventional Indian look, we opted for kundan earrings and a matching clutch. Cocktails are more formal than the former so keep your outfit understated – i.e., not too blingy or bright. Most people typically opt for western outfits but Indo-western outfit works equally good! You can go for a saree too. Rent A Closet has a loooong list of designers with them like Manish Malhotra, Manish Arora, JJ Valaya, Rohit Bal, Shantanu & Nikhil, Ridhima Bhasin, Anamika Khanna, Varun Bahal, Ritu Kumar and Anju Modi. Oh, and their in-house designer Aarna is simply amazing! We loved every piece by the designer and you guys should check it out too… The rental price starts from just Rs 1499 and can go upto Rs 30,000 – which totally depends on the kind of work. If you’re in South Delhi, you can visit their store at Nehru Place or just head over to their website. They currently deliver in Delhi & Punjab only. We are so stoked about this collaboration with Rent A Closet, there will be some cool offers too – so watch this space! Hi,My wedding date is 3rd of feb Nd I really want a designer dress for it...do u send d dresses to Indore? I want dresses for my pre wedding shoot too in indore. hii... is rent closet is present in varanasi?? Inexpensive & Fab Diwali Outfit Ideas!